We have some nice restaurants near us without having to go Downtown, which is nice. One of these is an Italian restaurant that we have been going to for years. I remember seeing the beet salad on the menu, but always passed over it in favor of the Caesar Salad. Which is amazing! One time we went there, they were featuring the Beet Salad, so I ordered it. Wow! New favorite. I have always liked beets. I grew up eating them pickled, boiled, and in Borscht, a delicious Russian soup. Though we ate pickled beets in salads, we never had them roasted, or plain in a salad with a vinaigrette. 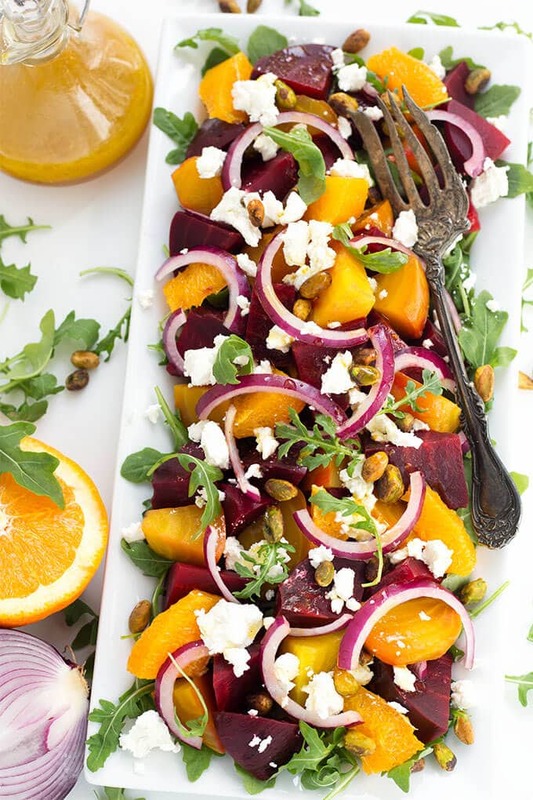 After having the one at the restaurant, I was determined to make my own version of Beet Salad with Goat Cheese and Orange Vinaigrette. The first few times I made it, I oven-roasted the beets, and it turned out excellent! I did have to revamp the orange vinaigrette because I kept making it too sweet. I do like it a little sweet, just not too much. Then I decided to try cooking the beets in my Instant Pot electric pressure cooker. It took less time and the results were very good! I like having the option to cook the beets more than one way. If you want to pressure cook your beets, I show you how in my Instant Pot Beets post. 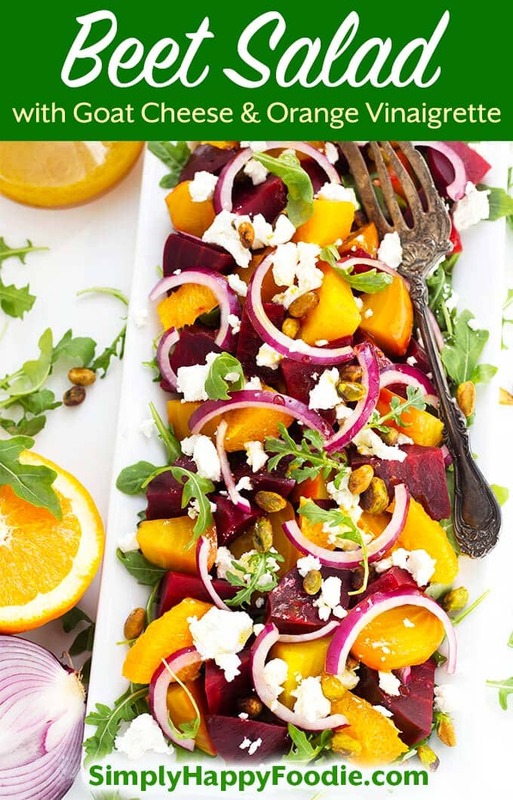 Beet Salad with Goat Cheese and Orange Vinaigrette is a wonderful salad that is full of amazing flavors. Served on a bed of baby arugula, it's a healthy meal. Also perfect as a small starter salad! If using arugula greens, spread them out on a plate, or in a salad bowl. 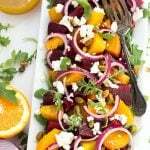 Layer the beets, orange segments, and red onion on top of the greens, if using. Otherwise just layer them without. Crumble the goat cheese on top. Dress the salad with a couple of tablespoons of the vinaigrette, or to taste. Add all ingredients to a mason jar with a lid and shake vigorously until well combined. If you don't have a jar with a lid, put all ingredients in a bowl and whisk until well combined. 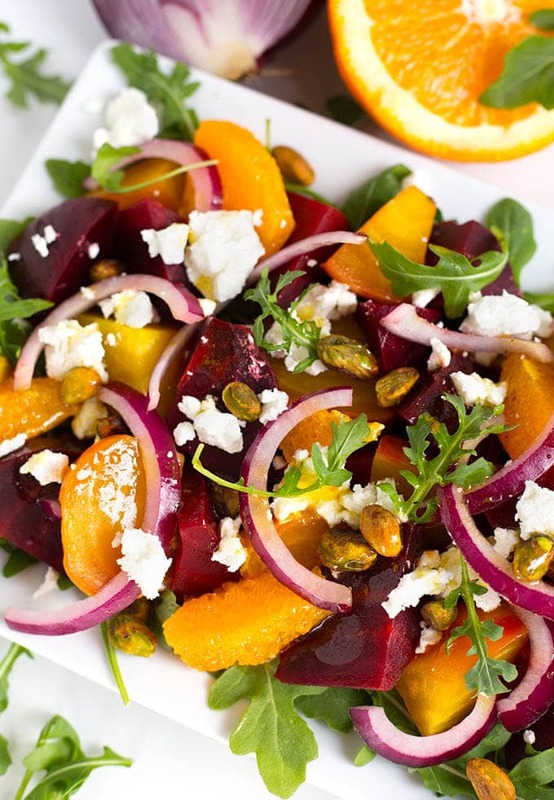 Beets can be Roasted in a 450 degree (F) oven for about 45 minutes for small-medium size beets (Don't peel. Rub with olive oil before roasting). Beets can also be Pressure Cooked (see my Instant Pot Beets recipe). Recipe inspired from my visits to Grazie Ristorante in Bothell, WA (they are awesome!). I loved this salad! The flavors are so good. I will be making this again!